Hi Everyone. As promised this is part II of last Wednesday’s post about a small family room. The one with the big RED sofa. Andrea says that the sofa is closest in color, to this image, but that it’s brighter with the lights on. Yes! Reds will go brighter in warm incandescent light. I don’t have a definitive answer about that one, but I do prefer warm lighting. If you don’t, that’s fine but I really do not like super-white LED lights. The only reason I’m doing this is for the benefit of everyone. I knew even before seeing the room, that these are common issues. So let’s rip this room apart take a closer look at what’s going on with this small family room or den, actually. In case it’s not clear, I am totally joking about ripping this room apart. Over-all, it’s a very sweet room. Cosy, and home-y. “The balance is off.” And it’s off in a way that’s very common. We have a strong element with the dark, handsome cabinetry. Directly across but only about 6 feet away is the RED sofa- another strong element. Which, BTW, I think it’s actually a very nice red. In fact, I think that the decorator and husband were correct. What I feel is not right is that the sofa is a little too big. And if I had $1,000 for every time I’ve seen this, I could happily retire. Okay, fine. That’s an exaggeration, but the issue of too big furniture is as common as corn flakes. And it’s not entirely Andrea’s or the decorator’s fault. Like perhaps the wonderful Spruce Street sofa at Serena and Lily that’s now on sale if you didn’t hear yesterday. All of their furniture is 20% off! To read more about that, please check out what I wrote about it. However, I only plug brands that I LOVE! Let’s get back to Andrea because it’s not helping her to say that she has the wrong sofa. It’s a fine sofa. Very pretty and we are going to make this work. The sofa and cabinet are saying sophisticated modern-traditional and the wicker chairs, floral fabrics and art are saying country cottage. I say that there’s too much of the cottage-y elements and that the room is looking somewhat tired and dated because of them. And then the sofa feels bossy because of that. We have to give some sass to the other elements. Some would say to 86 the wicker chairs but they fit nicely on that end of the room. It’s the fabric that I’m having an issue with. It’s too Victorian/porch-y looking. In addition, the furniture aside from the sofa is all a black-ish color. And it’s not that it’s awful; but it’s not helping. The sameness is tiring to the mind. Let’s look at the walls. We need a hunkier/handsome color, I think, to marry the cabinet, rug, and sofa. I know that you’re wondering about the blue from Wednesday’s post. However, I do not see that color for this room. I think that would be better in a room that’s a bit larger and with more windows. A color I would look into is Benjamin Moore Chelsea Gray. (haha. They are recommending this for a den or library. That’s because it’s like a warm hug) This is one of the 144 colors of the Laurel Home Paint Color, Palette and Home Furnishings Collection. And yes, that’s another plug. ;] Don’t forget that the prices of all products are going up on November 13th. You will get an updated rolodex if you already own one or get one before that date. Chelsea Gray is one of my favorite neutral backdrops and looks fabulous with both colors, white, black and art. It is a deep, but not too deep, warm gray with a touch of taupe. When there is a long bank of dark cabinetry AND a TV, the walls always, always, always look better in a fairly deep color. And deeper paint colors are wonderful for small rooms. The pastel peach is allowing the strong elements to be too strong and a deeper color will quiet them down. Next on the list is the window treatment. The pelmet (valance) is not working for me. And Andrea saw it in the PHOTO and wrote me that the tartan needs to go. But I think that the entire thing does and the lace, too. I believe Andrea mentioned that some natural blinds are coming and that is great. I love that. However, I would do away with the valance altogether, because this is a small room and it’s too much. The wicker chairs are WONDERFUL! I would really like to change the seat cushion as well. I would make it a little thinner and perhaps do a dark velvet. Or if the rug changes, it could be more colorful. But no flowers. Or if flowers, something higher end. Pillows are a great place to splurge on a more expensive fabric to elevate a room. A tawny leopard print would be cool for the back pillows. This is not at all expensive, but I think it’s fun and stylish. The bookcases are very pretty. They will look wonderful in front of the deeper color. And the sofa will also be better balanced. I would add a couple more pillows. This Marmar pillow from Spark Modern on Etsy is pretty fabulous I think This brings in all of the colors and will also cool down and lighten up the sofa. Maybe a lumbar pillow in the middle out of Chiang Mai Dragon would be a fun accent. A Leighton dark blue on blue pillow would be cool behind the Marmar pillows and cool things down somewhat. The mirror over the sofa is hung way too low, but it’s also too small from top to bottom. And again, too much of the same color as everything else. I would hang a large wonderful mirror over the sofa. This is the Hampstead Mirror and it’s on sale right now at William Sonoma Home. (30% off with code: BEDROOM) It also comes in white and black! I love them all, but I think the wood tone would be the best choice for this room. The large mirror will also help balance out the light and make the room look larger. There are two sizes. The large size which is 35″ x 50″ should be perfect. OR, we could do an art wall, like in Wednesday’s post. But I would like to see other smaller groupings of art to replace what’s there and there are still parts of the room we can’t see. And also, in the groupings, I think that the pieces should be larger. It looks a little ditsy as is over the one bookcase. But I would also like to see more sophisticated pieces like at Minted, Artfully Walls and Anthropologie. Of course, art is subjective and I respect others’ preferences. However, what’s there is not elevating the space, IMO. OR, you can put up your six-year-old’s art, or your aunts. I don’t care. But please, we have been through the local art thing every time I mention art. I am using the retail sources as examples of interesting art that’s not hideously expensive. It comes framed. There are a lot of pluses. But of course, it’s not for everyone. I just have to say that, because it always seems to come up. I would consider changing the rug. It’s not that what’s there is bad, but it looks a little tired and heavy and the floor itself is not very dark. I think that a plain seagrass rug with a black trim would be wonderful. Or perhaps an Oriental with a unique design. I like this one from Darya Rugs. The red can be different especially because it’s not the predominant color. This is just one way to go. If the rug stays, then I would do a seagrass rug with a neutral border under it anyway. It looks a little small for the room and the layering will add richness and texture to the design. Coffee Table. The one that’s here is very pretty. It’s tea table height. But it looks smooshed up against the sofa. It should be at least 10″ away so that folks can skootch their little legs in there. And it matches the bookcases too much. I love this lacquered round coffee table from Anthropologie and it’s on sale!!! I love this because it adds more gold which is always a good thing and a lighter color which we need too. This table would look terrific on top of the rug that’s there and freshen it up, too. Note: Sunday morning. I should’ve double-checked, but this table is probably a little large for the space. These posts are conceptual in nature because I am not there and I am not working from a scale drawing. I hope that y’all understand that. But the idea of a small gold table is what I was going for. Well, that’s pretty much it for me. I put a small widget together to show the different elements that might be incorporated. Please use the arrow to move it along to see the rest and click on the images for more info. Better wall color. This one’s going to make a big difference. Well, I’m back from my event tonight with the 25-yr-old fashion bloggers haha (yes, I felt horribly out-of-place) and the hurricane is still bad but not quite as dire as last night. At least not so far, but that can change quickly. And at the very least, these storms cause a huge amount of disruption. If you’re in Florida and you still have power, please say hi and let us know that you’re all right. PS: please don’t forget to check out the hot sales pages. You can access them in the top menu bar or at the link. And also please check out the info about the Serena and Lily upholstery sale. *20% of any money earned through Serena and Lily sales will be going to help the relief efforts from the recent hurricanes. That is from the 8th-25th of September when the S&L sale ends. The Stained Wood Trim Stays! What Colors Will Work With It? I think just updating the window treatments and switching out the floral fabrics would make a huge difference. I like the black mirror with everything in the room. And I think a light blue with a hint of aqua for the walls would be gorgeous! It would set off both the black and the red. Add your third pillow suggestion and you are there. It takes HOURS. And that is the problem. First there’s the back and forth which can be several emails. Then, they say that they want to hire me and then I send over a proposal. Never hear back. This can happen numerous times, before someone is serious. So, then I ended up charging 1/4 (or less) what I should have because nobody wants to pay for the time it really takes. Plus, it’s super exhausting to do these kinds of consultations. Often, the photos are so bad that it’s impossible. Or, the colors look different in every photo. Lots of issues. And there are the folks that no matter what I would recommend, it’s going to not be so great because there are some givens that I can’t deal with, like horrible architecture as an example. What I’m trying to say is that I was doing these consults, which were exhausting and I wasn’t making any money. And it was preventing me from doing the things that ARE making me money. There has to be a balance here. While I want to help people and find that gratifying. I need to be able to support myself, too. But I will try to do these more often. However, folks need to understand that if they send in a note, I may not be able to respond or use their home. I knew that this one would resonate with a lot of readers, but some homes are quite unusual and then it’s not applicable except to that particular home. Hi Laurel…really like your recommendations! I really enjoyed this blog. I like that you took someone’s not just right room and helped them. Wow…I really learned so much! Thank you! That was a fascinating study in interior design, made all the better because it was true to life. Love when you do this! Thank you. We had chosen a greige for our new house, but now I am leaning towards painting the long wall in our living room with the dark bookcases and tv a darker color. We use SW in our small town, and I already checked it out using their online tools. Now to convince the hubs! I’m sending this wonderful post right on to my lovely friend who has asked me to help her with her tiny little family room. I too really enjoyed how you elevated a room we can all relate to. It’s nice to see how your suggestions are all attainable and classic. Great work! Actually, there should be more light, with better lighting and the big mirror. And Chelsea Gray is a medium-dark shade. Not at all super dark like a brown or navy. I love when you do a ‘real’ room! Looking at all the perfect rooms can make it feel like our real life decorating is so far from ‘perfect’. 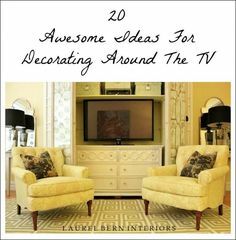 I agree with Sharon about the 2 smaller bookcases –if they were removed there would be room for end tables and lamps that would bring another (non-black) color into the room. Maybe there are ‘bookcase’ end tables because I can see that Andrea is a book lover!! This could be my living/dining room! It has given me so many answers on how to proceed with my living/dining room combination. You are the best! I loved this post! When I see pictures of rooms that could use some help I usually have some ideas. And I love to compare my ideas to what a professional would do. Everything you suggested were things I was also considering about the room. So it was fun to learn that I was on the right track. I agree with Sharon A….I think the small bookcases should go & be replaced with end tables with some nice lamps. Yes, lighting is important and the big mirror will add shine and sparkle. The dark color will be handsome. 1. Wall color, but I have no idea what darker color is right! I’d also consider wallpaper — maybe dark stripes that would coordinate with the rug and gorgeous sofa? 2. Balance of masculine and feminine. I’m always aware of this; I’m married and my rooms need to look like a guy lives here, too. The black furniture is masculine but the flowered prints and tiny artwork and hanging plates strike me as too dainty/feminine in contrast. Buy real flowers if you love flowers. Make a picture wall behind the sofa using lots of the little artworks and leave other walks bare for relief, or rehang the mirror. Ditch the floral fabrics in favor of something bold and fun. The sofa strikes me as a strong feminine statement with its curves and lipstick color— it’s great. It balance the black wall unit. The wicker chairs are lovely. 3. 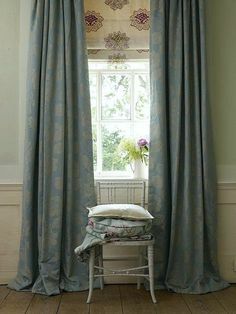 Window: hem the lace curtains to window length since traditional lace curtains were often that length. They can look skimpy going to the floor. I adore lace curtains and don’t care if they aren’t trendy, but they look odd when they are too long. Nothing else gives the same quality of light. They’re best made in all-cotton from the old looms in the U.K., preferably in a non-flowery pattern. I’d remove the entire valance and consider getting (red?) floor-length drapes to give the window more presence. 4. The coffee table is too small and high. Get a “masculine” one in darkish natural wood. There’s no unpainted wood in this room except the floor and that bothers me. I think you’re entirely right, Laurel, about the contrast in styles (cottagey v more sophisticated) being a big problem here, so yes to changing the window treatment and the wicker chair cushions, and to beefing up the accessories such as the mirror, which is indeed too small. And the coffee table looks both too tall and not quite hefty enough, although it’s lovely per se. Could it go end-on in a corner, as it seems a better height for an end table? I think yes too to the grey paint colour, although I shy away from that sort of thing, partly because of our wet and often grey climate and because we have far fewer and much smaller windows than I see in most American homes (but that’s just a mental block on my part, like teaching myself to hate azaleas and rhododendrons because we can’t grow them) — I wonder about a dado rail with off-white below, as in your illustration of the colour, for a brighter effect. But I also think a lot depends on the rug. If the rug stays, I think any florals have to go, even the Chiang Mai Dragon you suggest as a possibility. I think from looking at your suggestions, a dark blue velvet would be a good solution for the wicker seat cushions, with a pillow in the red and blue chinoiserie fabric seen in your photo of the S&L sofa. Or the two grey and white pillows seen on Andrea’s sofa! 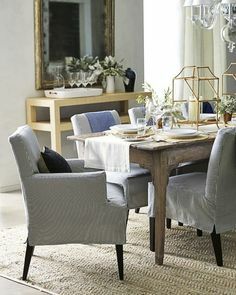 But if the rug goes, replaced by your suggestion or similar, that opens things up more, to the Chiang Mai fabric and some paler blues in the accessories. Your rug would also go better with the floor colour. Rather like this room once the window ‘treatment’ has gone & if that heavy black mirror bearing down on the red-she-said sofa could be removed. Absolutely agree that the room Is too cottagey & adding a little gold as in a new coffee table would be lovely. A depth of paint colour on the wall would balance the depth of colour on the sofa. Hope that Andrea will let us see her room whenit is finished? Hi Laurel. I really liked this post. I love it when you take a room that’s not quite coming together and present solutions. I’ve been reading you for over a year now and im so grateful for everything I’ve learned. 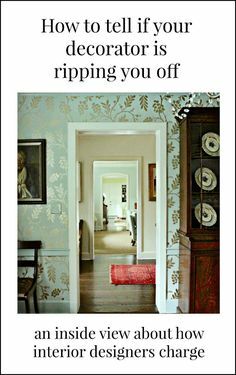 My first impressions (after salivating over the gorgeous built-ins and the sofa, which I love) were that the wall colour, mirror, florals, valances, and carpet were all making the space feel a little old fashioned. By incorporating your suggestions to update the style, Andrea is going to have a gorgeous room that will be at once cozy and fresh. I think you nailed it, Laurel. Personally I love the sofa…it’s very pretty. Your suggestions about the wicker chairs are great. The chairs are really pretty and just need an update so they are the same “level” as the new sofa. Kind of like getting a new dress and being sad when you have to put on your old coat. Put a new scarf with that old coat and then everything seems more pulled together. Hope it’s not too bad wherever you are. The only time I’ve ever been through a storm was super-storm sandy. HA! Fine. They can call it whatever they like. It was no longer “tropical.” Who cares? It was two giant storms converging into one raging tyrant. I ran for the bathroom, cause I felt the house shake; there were trees crashing down all around us and two little boys were killed just a few miles from us when a tree hit their home. Horrific!